As a tribute to the true essence of hacking, I took over Barcode Shmarcode as of 2014. I had just spoken at 2013 BSidesDE about InfoSec Learning Resources. On the way back home, five or six of us ended up at a restaurant including myself and Heidi. When I mentioned the contest as a great non-technical hacking competition, she suggested I take over the contest. I pulled in my good buddy DA and the contest continues! Surprises have brought along a few other judges in DA’s absence. The contest was origionally created in 2009. Please feel free to reach out to us via the contest official twitter, @Shmoo_Shmarcode. If you do a write-up about your entry, please let me know. 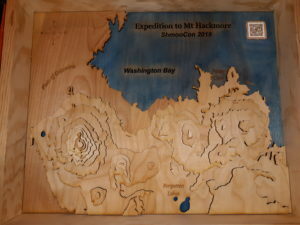 This year’s challenge is a climbing expedition to Mount Hackmore at ShmooCon. This will be the 15th annual climb and each year is different. 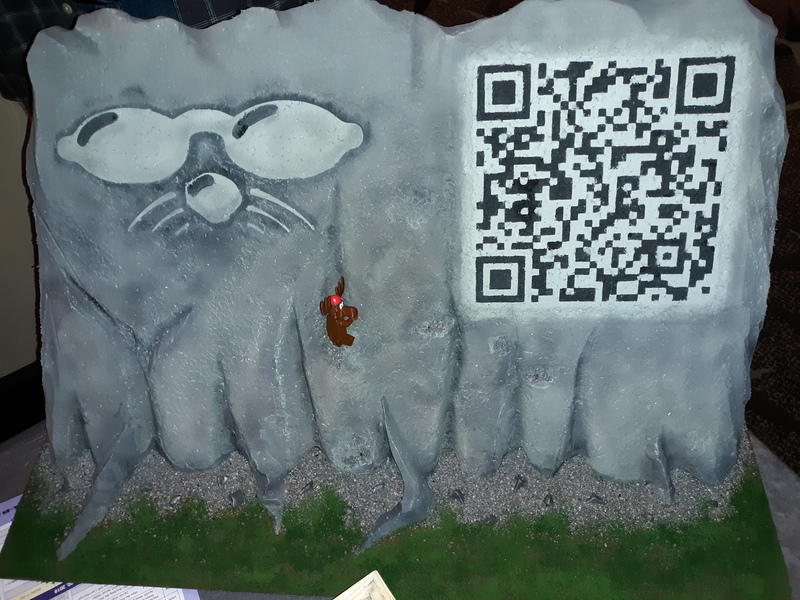 Through the cliffs and between the glaciers amongst a sea of hackers, you must forge a path to the Barcode Shmarcode basecamp with your valid ShmooCon Barcode. Your entry must be scannable by our scanner, the Motorola DS4308. This climb is nothing like your average foothillesque cell phone apps. The @Shmoo_Shmarcode team, @ForgottenSec and D9, are looking forward to each person’s climb. This year we had a total of 7 entries which is roughly half of the normal amount, but almost all the entries were very impressive and lived up to one of the tougher themes we have had. We had a variety of different techniques that seemed to match up with various hackerspace tools and techniques: 3D Printing, cross-stitch, media blasting, and laser cutting. Almost every entry showed incredible effort. Heidi was so pleased with this years entries that all non-winning contestants will receive at least the option to purchase a no-contest ticket in addition to the winners receiving tickets as a prize. The three winners were one repeat winner, Sarain with “Mount ShmooMore”, and two repeat winners: J-Nice with “Cross-stitched Climber” and @SkillfulHacking with “Climbing Moose”. This is “Mount ShmooMore” from Sarain, our only returning winner this year. This is a piece of styrafoam that was media blasted with baking soda and a 3D Printed Climbing Moose. This is the “Cross-stitched Climber” from J-Nice. 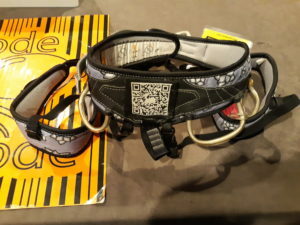 This is a climbing belt with a couple of climbing gym tags and hand stitched small QR code. 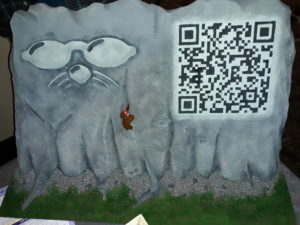 This is an incredible amount of stitching to get the QR code correct. This is a video of “Climbing Moose” from @SkillfulHacking. It was the second entry submitted. It is a rebuilt climbing Santa with 3D Printed climbing axes. 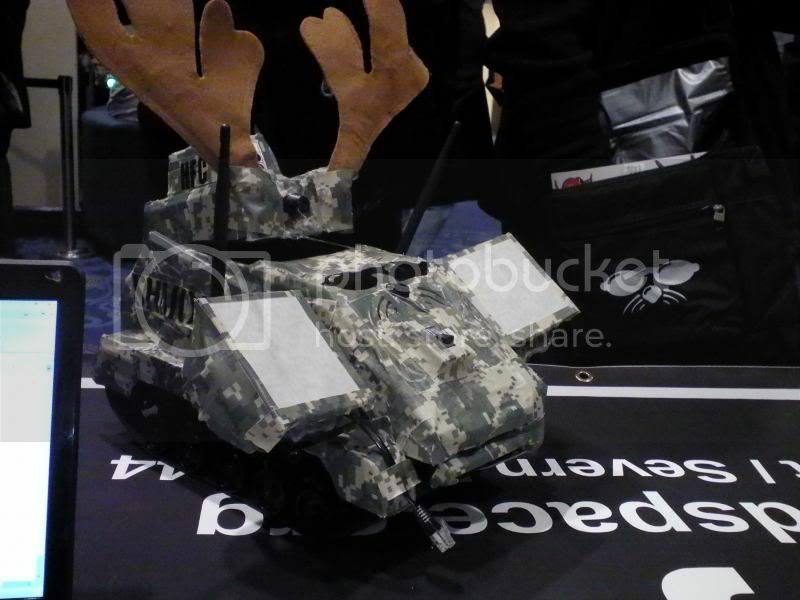 There was also an entry by a father daughter pair that was neat named “Conquering Motor Mountain”. It utilized a Raspberry Pi and some motors to have a figure climb a mountain that was neat. Hacking: the final frontier. These are the voyages of the starship ShmooCon. Its mission in its fourteenth-year: to explore strange new knowledge, to seek out new information and new methods, to boldly go where no one has gone before. 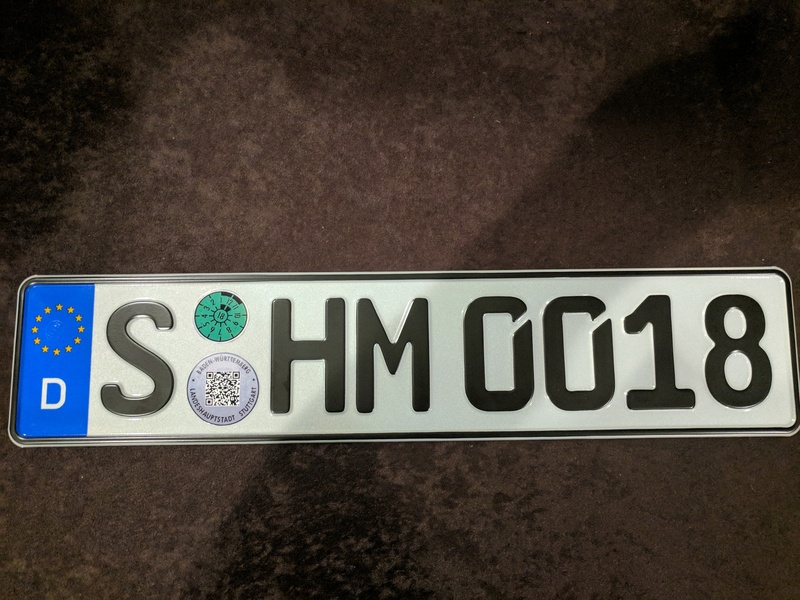 Your away mission has one simple directive – your barcode must scan valid for ShmooCon 2018 registration. If it doesn’t scan, you cannot enter the contest (although we may still award points for effort, so you know, try). Our species of choice is the Motorola DS4308. • Best use of theme – Show your spaciness! • Originality – Creativity is like a tri-corder; use it for anything! • Best use of materials – Go where no one has gone before! 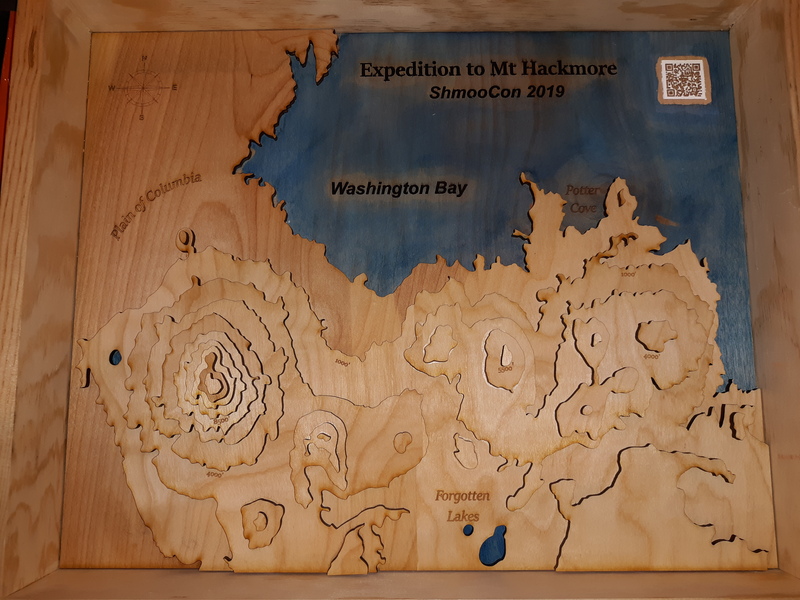 The top 3 entries will each win a coveted ShmooCon barcode for ShmooCon 2019. 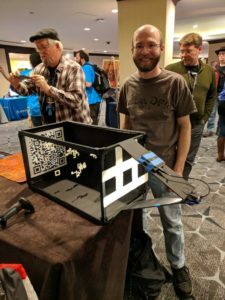 JUST IN CASE YOU MISSED THAT – THE TOP 3 ENTRIES WILL EACH WIN A COVETED SHMOOCON BARCODE FOR SHMOOCON 2019. @ForgottenSec is now joined by @datapacke7 as your judges. Look for them near registration on both Friday and Saturday (times will be posted in the program). Winners will be announced at closing ceremonies. I was quite surprised that we only had 14 entries for Barcode Shmarcode 2018, but we had no shortage of amazing ideas. “Shmoo Constellation” by Sarain – With amazing perseverance, the stars held up by strings scanned through the looking hole. “Journey to Babel” by Cragin – Fully utilizing the star trek theme, this is similar to the badge for Ambassador Gav from season 2 episode 10 from November 1967. “Two Other Worlds” by Amanda – this Diorama is a very creature take on theme. 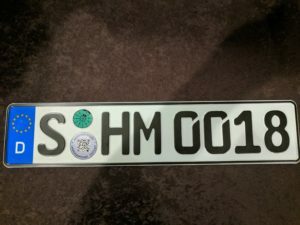 “German Shmoo Plate” by Mark – a unique ShmooCon memorabilia idea that led to several people asking how they could acquire a similar licence plate. We like video games and we suspect a few of you do too. This year’s Barcode Shmarcode theme is video games. 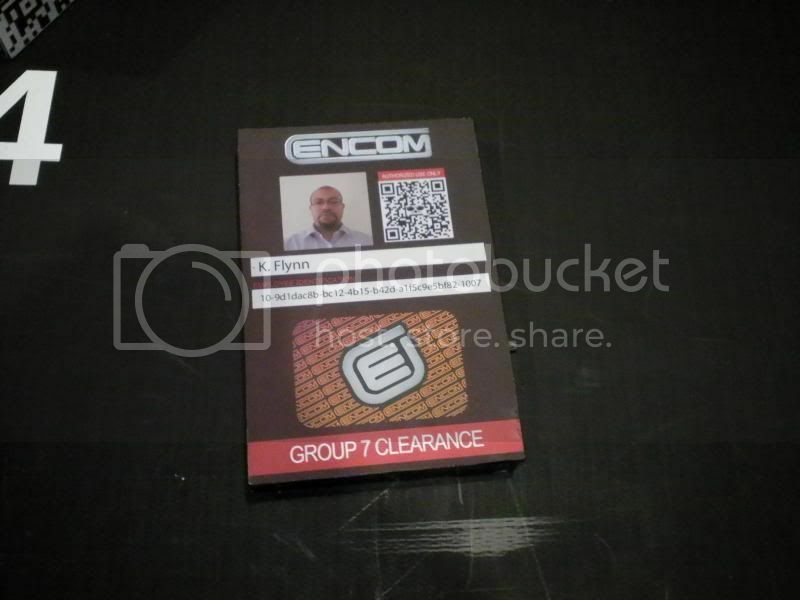 Re-create something from a memorable game incorporating your valid Shmoocon Barcode. Go Bananas! Use all available resources to show off your hacking skills. In fact, there is only one – your barcode must scan valid for ShmooCon 2017 registration. If it doesn’t scan, you cannot enter the contest (although we may still award points for effort, so you know, try). Our weapon of choice is the Motorola DS4308 or the flak cannon. 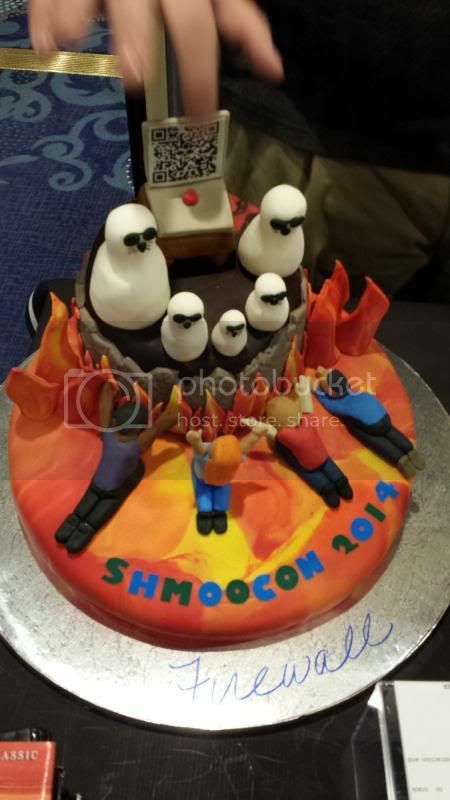 Best use of theme – ShmooCon is about all the games this year, not just Hack Fortress! Reach your limit break and achieve Final Heaven. Best use of materials – The BFG wasn’t made in a single day; you can score epic frags with a more little effort. The top 3 entries will each win a coveted ShmooCon barcode for ShmooCon 2018. Are you on the path of destruction? Will you make your time? Have the Ayys already won? Is your energy bar full? Once again @ForgottenSec and @DA_667 are serving as your judges (their favorite games are public). Look for them near registration on both Friday and Saturday (times will be posted in the program). Winners will be announced at closing ceremonies. Here’s my entry to this game. That’s right – Barcode Shmarcode is back and you should get ready to ride. 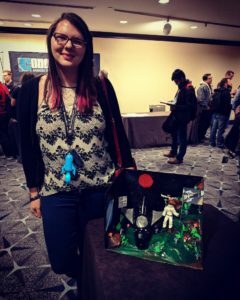 This annual event is an opportunity for you to express your geek creativity to the fullest extent. Your mission? 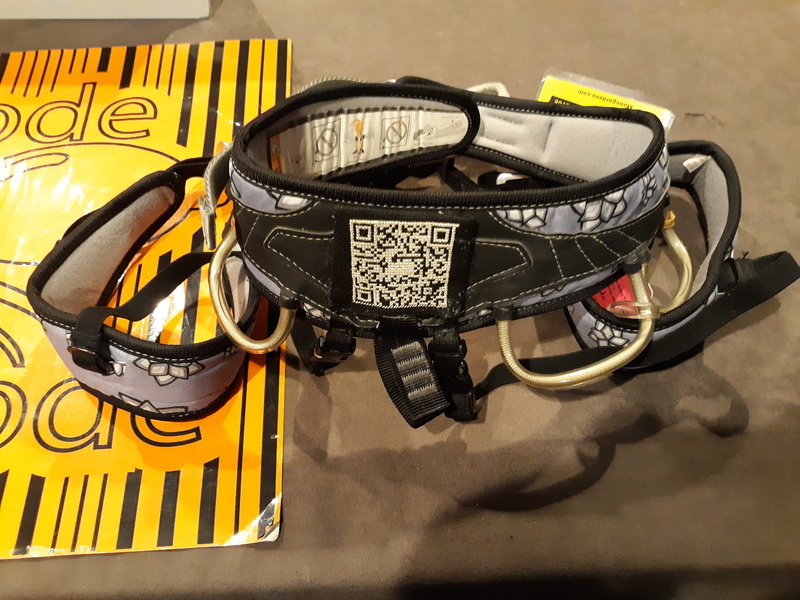 Find the coolest, l33t3st, most hacker-ish way to print your barcode and then wow us at the con. 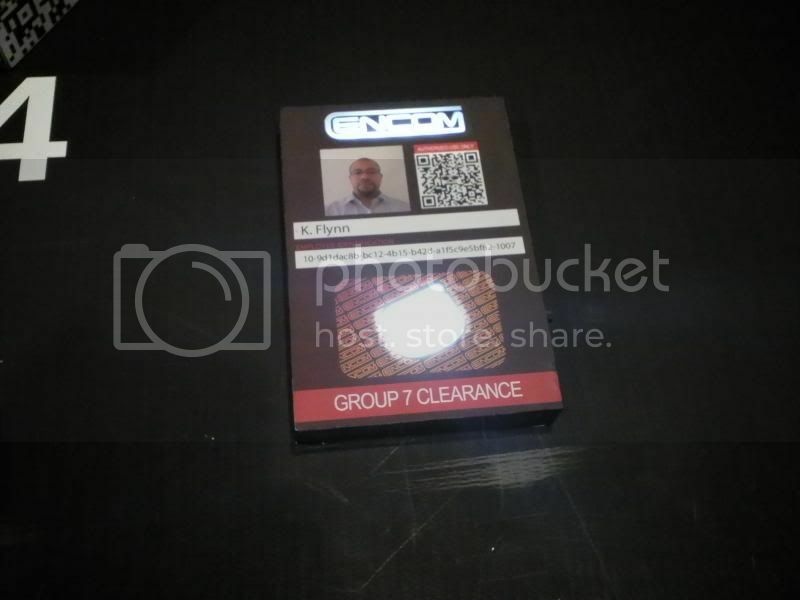 In fact, there is only one – your barcode must scan as a valid for ShmooCon 2016 registration. If it doesn’t scan, you cannot enter the contest (although we may still award points for effort, so you know, try). Our scanner of choice is the Motorola DS4308. 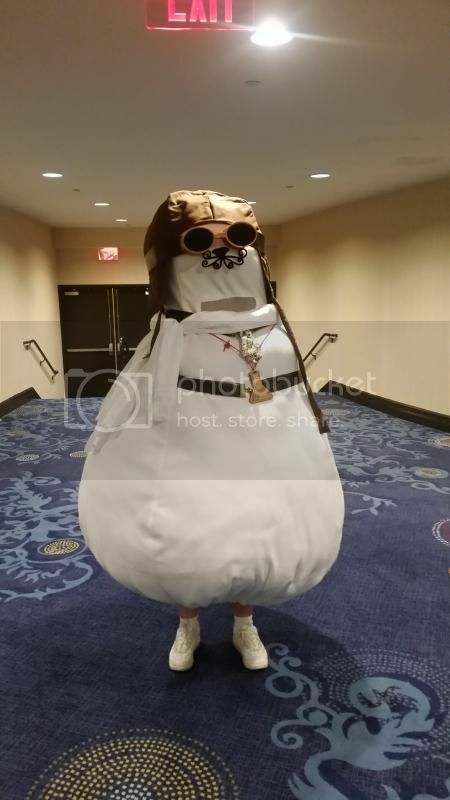 *Best use of theme – ShmooCon has caught the cycling madness. Use your imagination and blow this theme up! As long as it relates to the bicycle or cycling world in some fashion you’ll be pedaling down the right path. *Best use of materials – No matter how how much time you spent using photoshop, a simple printed piece of paper probably isn’t going to impress us. Or it might. It just depends. The top 3 entries will each win a coveted ShmooCon barcode for ShmooCon 2017. So really, what do you have to lose? Once again the fine folks at Unallocated Space are serving as your judges. Look for them near registration on both Friday and Saturday (times will be posted in the program). Winners will be announced at closing ceremonies. Questions can be sent here. What is Barcode Shmarcode? What is at stake? Why the hell should you care? Barcode Shmarcode is an opportunity for you to express your geek creativity. 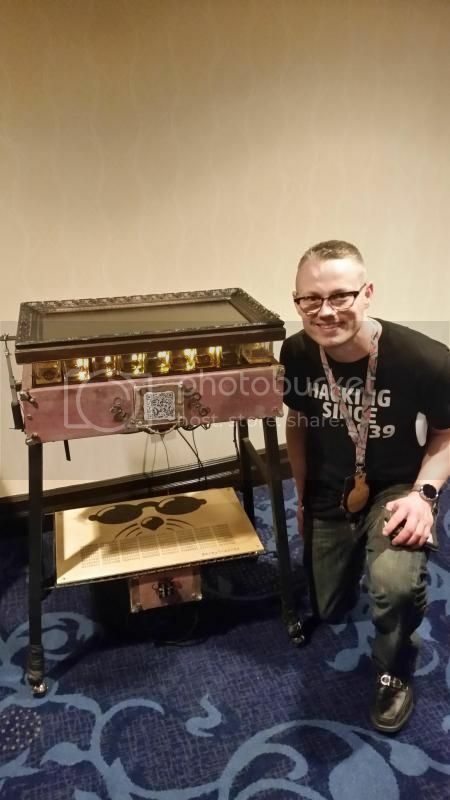 Find the coolest, l33t3st, most hacker-ish way to print your barcode and bring it to the con. 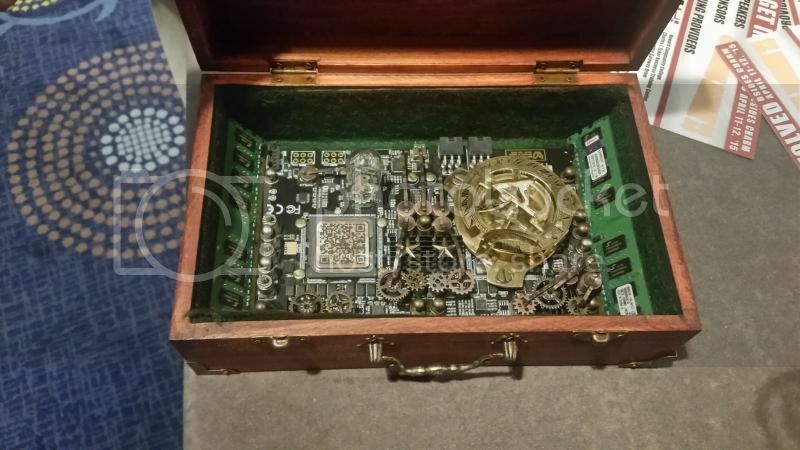 In the past we’ve seen cakes, cross stitch, Shmeat, an airplane boarding pass, beer labels, cereal boxes, arduinos with leds, and a laser pointer with something wrapped in electrical tape attached to it (no really, it was cool). Oh who are we kidding – there’s only one rule: Your barcode must must scan and be valid for your entry to be considered for judging. If it does not scan to a valid ShmooCon registration barcode, it is not a valid entry! We will be using a Motorola DS4208 scanner to verify your barcode – the same scanners used at registration. We will be available near the registration desk (Look for the goons in Unallocated Space T-shirts) on Friday from 3-6PM and again on Saturday from 2-5PM. Winners will be announced during closing ceremonies. 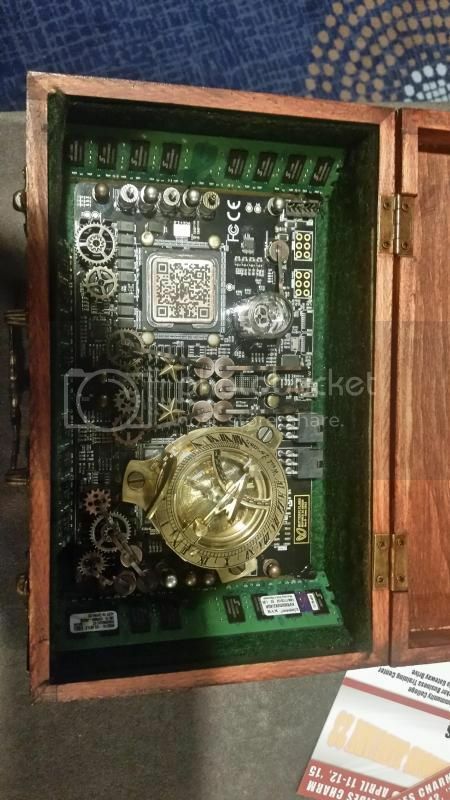 This year’s theme is Steam Punk… We don’t know about you, but we really like Steam Punk, now let’s make our barcode displays referencing them. The theme is not required, it’s recommend you try to abide by it, but an awesome submission that doesn’t could still win. We’re all hackers here, do what comes natural. 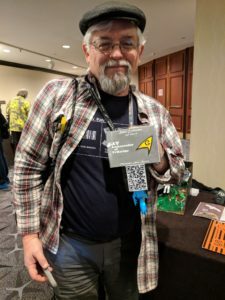 DC949 has a rule that they do not run any event for more then 5 years, but this year is the 6th year of Barcode Shmarcode. Heidi, the awesome organizer of Shmoocon, asked that we take over the event. DA and Forgotten organized and advertised the event and Buddy assisted during the conference to help run the table. This year we had 24 entries. 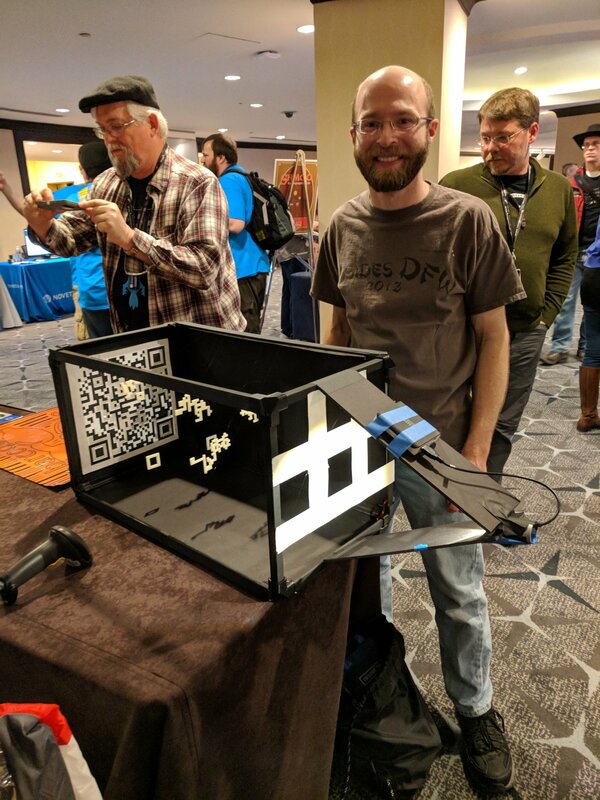 It seems some people failed to follow directions as a few entries didn’t scan, and one scanned to something that wasn’t their Shmoocon Barcode. We were impressed by the number of entries this year and we hope to as more or more next year. This years theme was “Hacker Movies”. RT @thejoshpit: Lego QR code #shmoocon pic.twitter.com/U4rRuStI <– wow. epic #barcodeshmarcode entry.